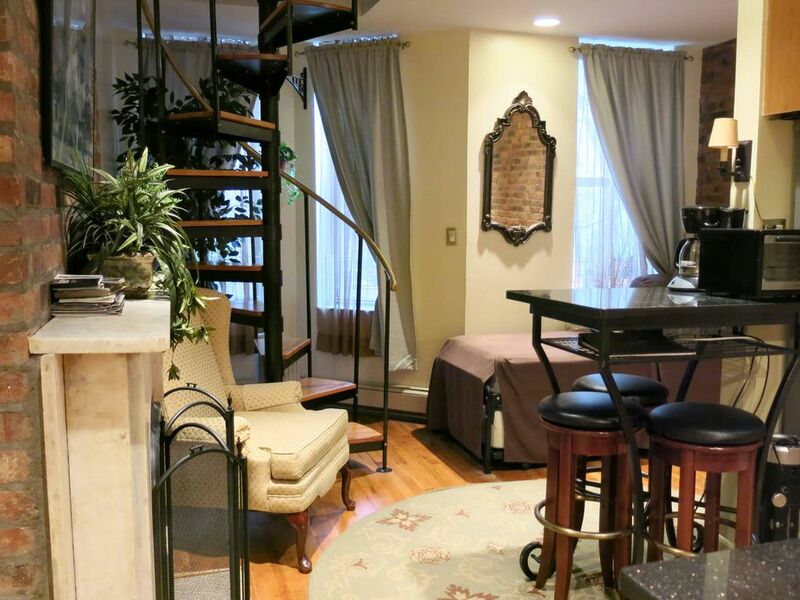 This is a true two bedroom two bathroom duplex apt in a unique landmark 2 family townhouse on a tree lined block in central Harlem. It’s located one block away from Marcus Garvey Park (which has basketball courts, walking trail, playground for young kids) and 9 blocks from Central Park. All amenities are included in this fully renovated, artistically designed home. Kitchen has all cooking needs. Flat screen TV with cable connection, Wi-Fi, exposed brick, hard wood floors - very cozy and comfortable for your long or short stay in New York. There is also a guide book in apt with lots of tips for your stay. The apt is near all public transportation. The 5th Ave bus is around the corner and will get you to museum mile in minutes. You will love coming home to this apt after a long day of sightseeing. This is a smoke free apartment, your security deposit will be withheld if this rule is not adhered to. Retired NYC Public School teacher, now a full time 'back to my roots' Jazz musician (Berklee College of Music) living in the soul of New York - Harlem. In the past ten years I've seen Harlem grow to what it is today, and want to share it with the world. This is why I have decided to post my duplex apt on this site. I hope all my guests can get a taste of the Harlem culture during their stay with us. I love Harlem for its Jazz history and hoping to further the tradition. 4 of us stayed in Bill’s unique location! The place is very clean and has everything you’d need for a comfortable stay. We ate breakfast everyday in the apartment, bagels and central, which saved us a ton of money over the week. We walked a took the subway or bus all over the city. Bill was very nice and responsive. He took the time upon our arrival to explain the subways and generally how to get around. There’s a grocery store and restaurants walking distance from the apartment. There are some colorful people in the area but we never felt unsafe at all. It was perfect for our family and so much better than staying in a touristy, crowded area like Time Square! We felt like we lived here! Great stay all around! Thank you Bill!! We all really enjoyed our stay. Convenient for the Metro and not far from all the attractions. The host Bill, was very helpful and so were the locals (which surprised us a little!). The accommodation was idea for our family with the teenage boys having their own floor. The only criticism (very small) was the lack of a kettle. The coffee machine was great for the coffee lover in the family but I do like a cup of tea. We managed with a saucepan so was not a problem. Apart from that no complaints and would stay again. We came into town with 8 of us for a wedding this past weekend. Bill could not be a more gracious host! He was there when we arrived and showed us the place. It fit 8 guests easily and was clean and stylish. He has a gas stove top/oven, toaster oven, and microwave as well as all the fixings! He advised us where to eat and shop if we needed to for groceries. The location is close to Central Park and the museum district. The subway is also close if you want to travel to other parts of the city. Very accessible overall and when we return we will definitely look for his availability first! Thank you for making our lodging easy! No complaints from us! Super! Unit is the 2nd and 3rd floor of a historic townhouse. Owner lives close by. Good water pressure and hot water in two, full-sized bathrooms. Thick masonry walls block most outside noise. Location is in south part of Harlem and quite close to LaGuardia airport. Convenient location near groceries/subway/buslines and Uber. Laundromat around the corner. Following busy days of sight seeing, we returned to the unit and ordered delivery. We used the subways almost exclusively for transportation and never had a problem. You can purchase metro tickets from either a kiosk or a manned station (west side of the street) at the Lenox/Malcolm X and 116th. You can probably also purchase at the 125th street station but we only used that station once so I don't recall what was available. We are happy with our stay here. Bill is friendly and helpful. The unit is cozy yet functional. As others have mentioned, watch out for the stairs as they are steep and narrow. There are not that many of them so if you do not have mobility issues, it won't be a problem. Missy S.Where do you live? We are fortunate enough to visit NYC several times a year. We always stay in midtown but my husband, 22 year old son, and I wanted to try something different. We were here in early December. We chose this place because of the location and all the wonderful reviews. I am so glad we did! It truly earns all these great reviews and I am happy to add to them. Bill is a great host! Excellent communication, helpful, flexible, and super nice! The place is in a great location with subways nearby, as well as grocery stores, liquor stores, and lots of food options. It is very clean and very safe. Not to mention there was plenty of room for the three of us and would even accommodate a few more people. I will definitely stay here again! Thanks Bill. Hope to see you soon! Great condo in West Harlem. Cozy and comfortable and a great,helpful owner. Location was excellent with great restaurants (per owner’s recommendation) within the neighborhood and close access to subway. Marcus Garvey Park two blocks away, full service laundromat around the corner, CVS , grocery store and liquor store two blocks away and jazz clubs per owner’s recommendation, within 6 blocks. Best stay and will stay again I the future! Laundry services available at an extra cost.